Don’t forget there’s tutorial video further down! I had just published vegan gluten-free blueberry muffins recipe before the trip and was quite obsessed with those. However, blueberries cost a fortune in Barcelona, which is why I used that I had in hand. It just so happened that apples were the only suitable fruits in my kitchen the morning I wanted to bake a new batch of muffins. So, I used those, added quite a bit of cinnamon and the result blew me away! Consequently I stuck to those low fat vegan apple cinnamon muffins for our entire stay. For the first batch I used only buckwheat. However, I wanted to bring the glycemic load of my muffins down and substituted half of the buckwheat with oat bran. As result, one muffin had almost 3 GL points less than before. Awesome, isn’t it?! 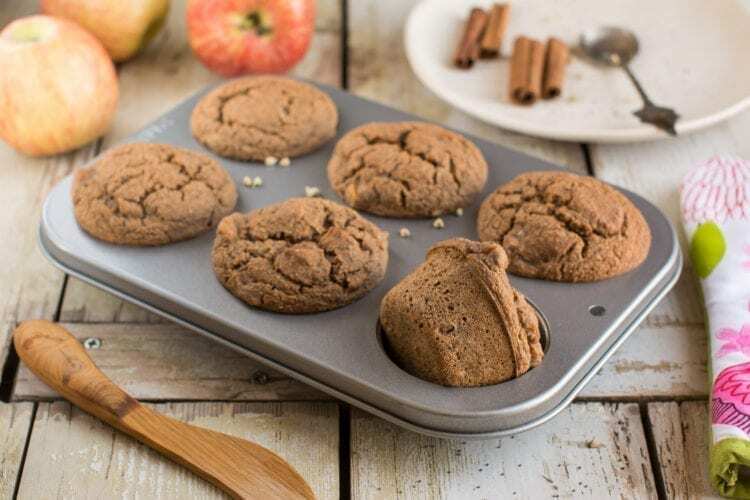 To sum it up, my low fat vegan apple cinnamon muffins are almost as healthy as muffins can get. 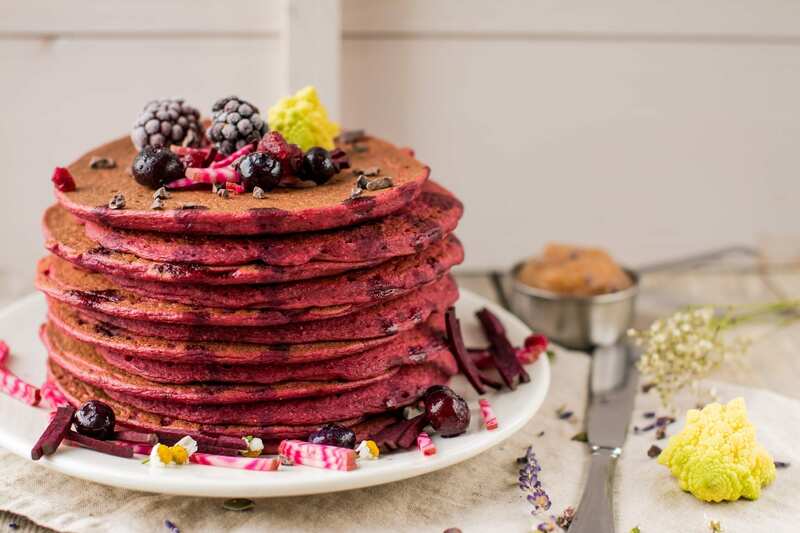 Besides being plant-based and oil-free, they are also gluten-free and sugar-free. Now, oil-free doesn’t always mean low fat. However, in this case I can proudly say that it does, because you only get 19.8% of calories from fat from this muffin recipe. Of course, you could make them even leaner by ditching the peanut butter altogether. In fact, I have tried nut butter free version and they taste equally good. Firstly, soak buckwheat overnight (or all day or at least 6 hours). Rinse and drain. Next, put all ingredients except baking powder, poppy seeds and diced apple in blender and blend until smooth batter is formed. Now, blend in baking powder. Then mix in (DON’T BLEND) poppy seeds and apple cubes. Finally, divide the batter between 6 muffin forms and bake for 40 minutes until the muffins are golden. 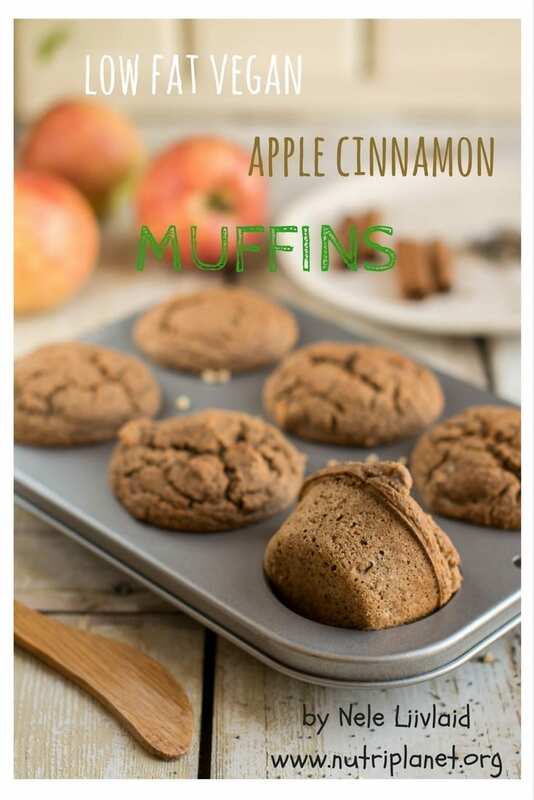 These low fat apple cinnamon muffins make a delightful breakfast or mid-morning/afternoon snack with tea or coffee. Nutritional info per ⅙ of recipe: 179 kcal, 24.6g carbohydrates (67.2%), 3.92g fats (19.8%), 5.83g protein (13.1%), 5.39g fibres, and 11.4 GL (glycemic load) points. Make smaller muffins by dividing the batter between 8 muffin moulds and bake for 35 minutes. You’d get 8.55 GL points and 134 kcal from ⅛ of the recipe. Now, if you don’t tolerate avenin in oats, use only buckwheat. Take 160 grams of raw buckwheat and soak overnight. Instead of 160g of oat milk, use only 100g. Next, make sure not to overload the muffin batter with apple cubes or they’d turn out too moist inside. Should you have a bit more than 100g of apple, cut bigger chunks and add them on top of each muffin. Furthermore, you can freeze the leftovers and heat your muffin in the oven whenever necessary. This way you save yourself a lot of meal prep hassle during the week. Finally, those allergic to peanut butter can use any other unsweetened nut or seed butter. Furthermore, you can also ditch the butter altogether. Thank you! I hope you’re going to like them! I wrote under tips: Now, if you don’t tolerate avenin in oats, use only buckwheat. Take 160 grams of raw buckwheat and soak overnight. Instead of 160g of oat milk, use only 100g. 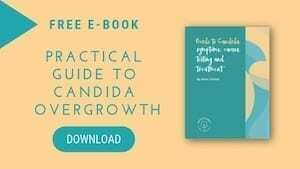 Is there anything to use in place of bananas to make it more candida friendly? You can use applesauce or pumpkin puree instead and add xylitol for some sweetness. The original recipe would be OK after the reintroduction is done. I’m having those muffins without any setbacks. Nele, I made these last night and they were wonderful. My sons favorite. 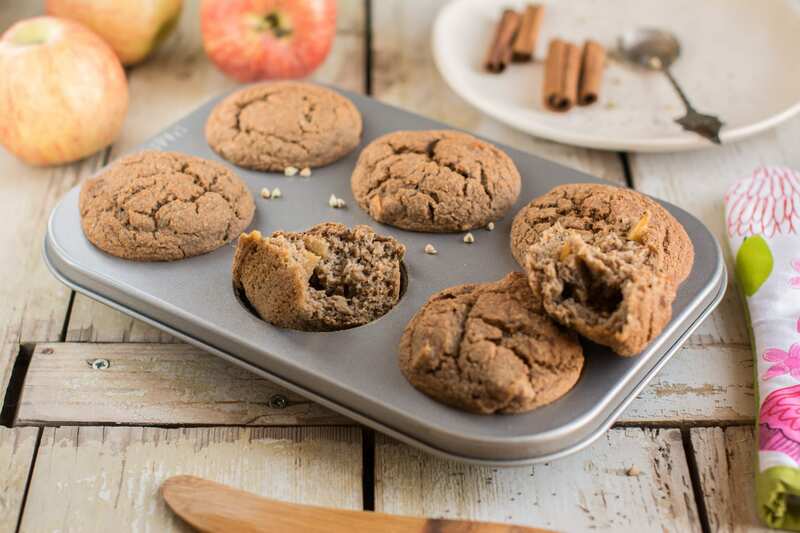 I was making another apple cinnamon muffin with banana recipe (tons of mashed banana in that recipe) but they were always mushy inside no so yours were much much better. The other recipe called for shredded apple but yum it is much better cubed. I used exactly the amount of apple listed just to make sure they were not too moist inside (ok, I admit to shredding half and left half cubed but was so wishing I had left it all cubed because I loved biting into those cubed apple bits). My batter was real liquidy but they turned out great but is that normal? For instance your chocolaty pumpkin muffins batter was real thick. At first I thought they were going to be too mushy inside also but it firmed right up after about 15-20 min of sitting there cooling. And I was worried at first since that batter was so liquidy but as I said, they came out great. I did use maple syrup and dates instead of xylitol but put half the applesauce in case the added liquid of the maple syrup would be too much liquid but maybe that would not matter. Yes, the batter of the apple-cinnamon muffins is supposed to be fairly liquid. The pumpkin muffins have much more puree in them and that’s why the recipe requires for more grains — otherwise they’d turn out too smushy. Hi Nele another quick question. We like the base of this muffin the best with the grouts and oat bran because my husband and son like the moistness so if we wanted a blueberry muffin for a change using this base, do you think we could add 200g of blueberries instead of 100g (200g since we double it) of cubed apple? Not sure if it should be equal in the substitution. (They liked your blueberry with millet but just thought these were more moist so is why I ask about just doing a substitution on this recipe). For sure you can! Add the same amount, but volume wise (not weight). Thanks so much Nele for responding. So you mean measure out 1 cup in a measuring cup rather than using 100g (2 cups if doubled)? I do kind of use the weight of 100g/200g when using cubed apple but for blueberries you are saying to measure 1 cup (2 cups if doubled) instead of weighing using grams or ounces?? Ok thanks Nele. I didn’t add the apples by the cup. I weighed 200 grams out on the scale for a doubled recipe. I got used to that since some of your recipes have all measured in grams and ounces and not cups. I will measure the apples and blueberries by the cup from now on in equal amounts. Thanks again for the help!! Don’t worry — it’s not a rocket science with apples and blueberries as they’re not the flour or liquid. A bit more or a bit less won’t be a big deal! Do let me know how it worked out! When you make it do you weigh it using 100 grams or use a measuring cup and add a full cup? 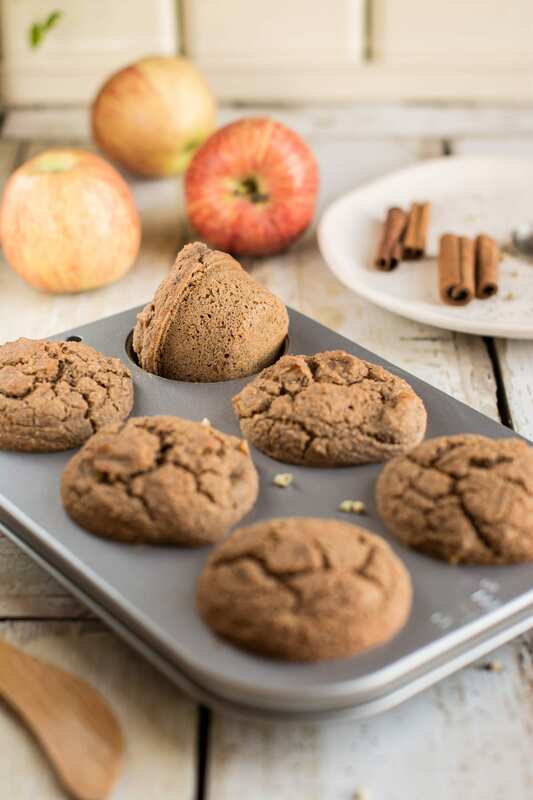 I guess the question for me when making them again last night was if I had added 1/2 cup+ more apple (a full 2 cups – about 260+ grams give or take – would it have been too moist or made no difference even if over the amount of grams you cautioned about)??! I will be making this a 1-2 times a week now since a favorite of all in the family so that is why I am trying to get the chopped apple down to a “science” per say lol. Sorry, my mistake. As blueberries are heavier, measure also 100 grams (it’s 3/4 cup actually). However, as apples are much moister, you might try adding some more — it’s up to you. Try with 100 grams first and see how it turns out. Hi Nele. I am amazed with your wonderful creations 🙂 If we substitute the banana for apple sauce, how much quantity we would use? Thanks a lot!! It’d be the same volume as mashed banana, i.e. about 3/4 cup of apple sauce.